On my way to my sister's wedding in Asheville, I happened to stumble upon this little church with a little cemetery right across the street! This church was the Hoopers Creek Baptist Church. 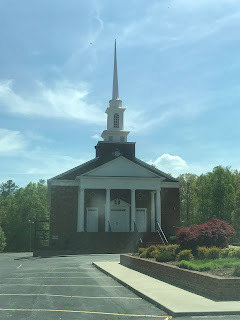 This church was located in Fletcher NC, right outside of Asheville. 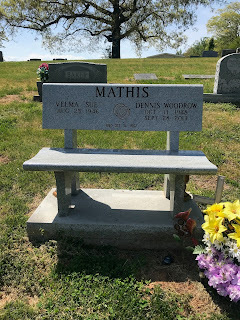 This tombstone really stood out to me because it is a bench! 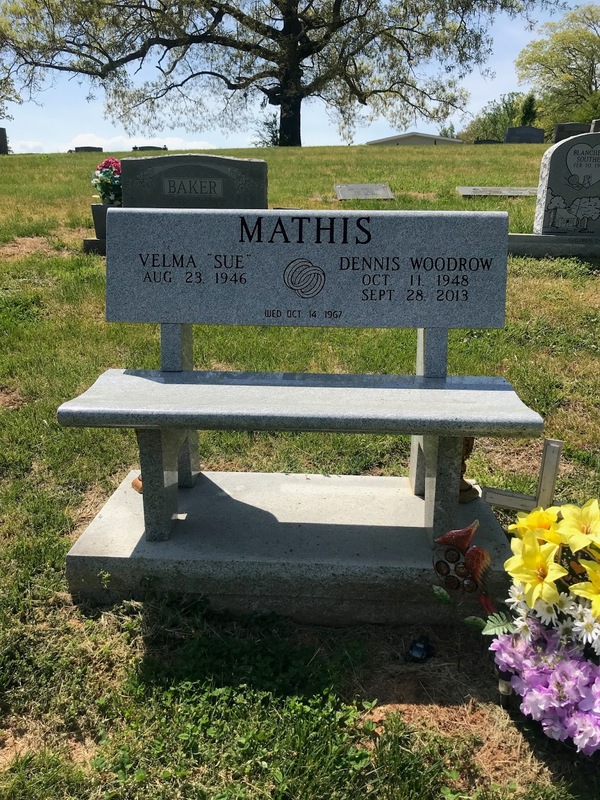 This bench belonged to Velma "Sue" Mathis who is still alive and was born on August 23rd, 1946. She married to Dennis Woodrow Mathis who was born on October, 11th 1948 and died on September 28th, 2013. It also says that they got married on October 14th, 1967. These people must have really been in love considering the wedding rings and the fact that it states the day they got married which most people do not do! This next tombstone also caught my attention because it is the first headstone I have ever seen that is completely black with a colored picture on the front. It also has flowers which signifies that someone had been here recently. 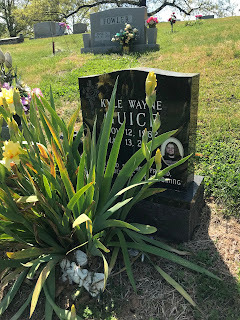 To get a better look at this headstone, I took a close up picture (to the right) which says "Kyle Wayne Guice Nov. 12, 1982 May 13, 2007 Beloved Son And Friend. For "Flowerdils" Are Blooming." I was not sure what this meant, so I decided to google this saying, but sadly nothing came up. Although, what I did figure out was that "Flowerdils" must be a word Kyle Wayne Guice must have made up because it is not a really word. I believe that this saying just means the world is still beautiful and, assuming this is his favorite flower, they continue to bloom for him. 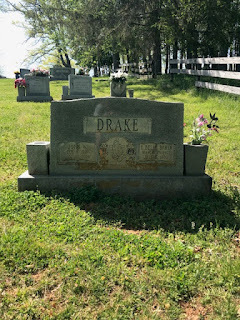 I was very curious to know more about this headstone considering this man only made it until 25 years old so I decided to look up his name. 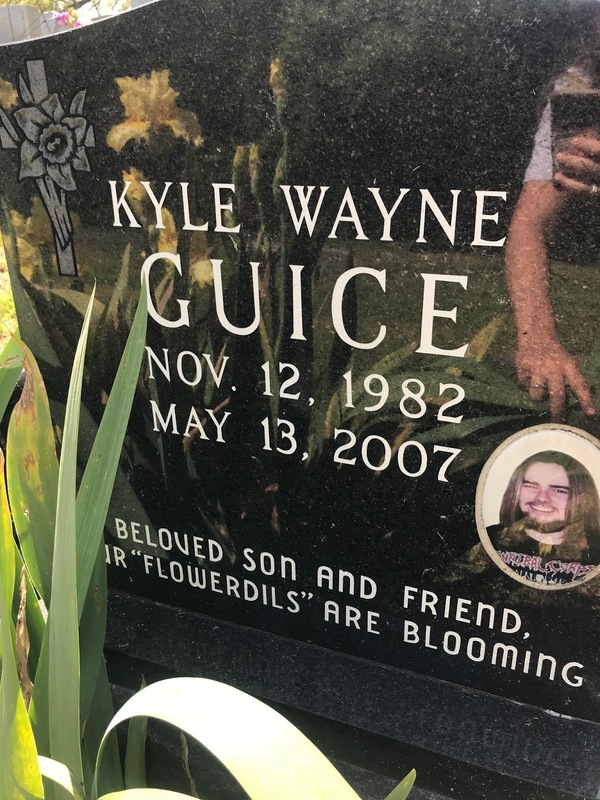 I actually found out that Kyle Wayne Guice committed suicide because he was on house arrest for a first degree-burglary and attempted sexual assault. 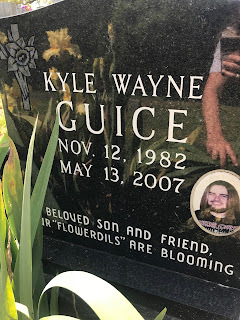 It also explains that Kyle shot himself but would not say where he shot himself. This was by far my most interesting find all year. Lastly, I enjoyed this tombstone because it is a heart. I have never seen a heart tombstone! It is very sweet! 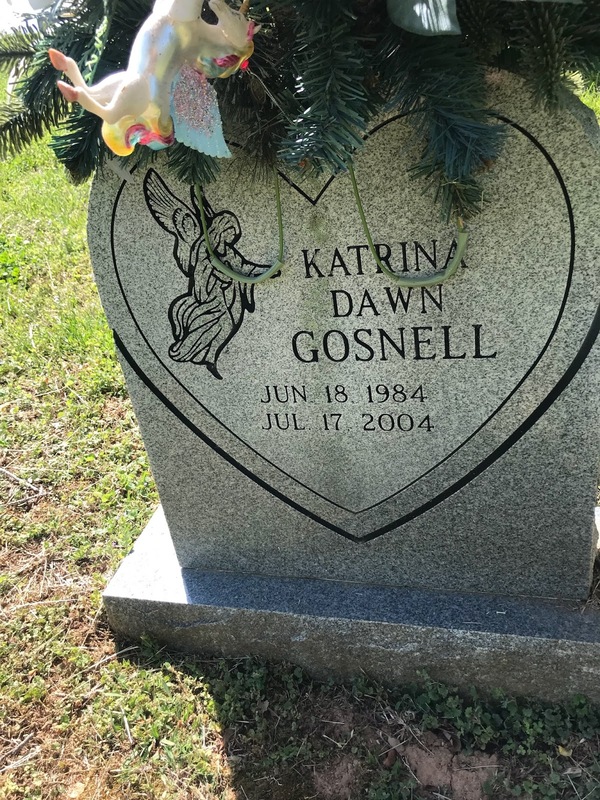 This tombstone belongs to Katrina Dawn Gosnell who lived from June 18th, 1984- July 17th, 2004. 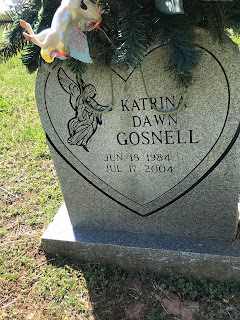 I also decided to find out more about Katrina Gosnell because she died at such a young age. Although, it did not say the causer of her death, I did found out that her grandmother was as Reverend. Her grandmother's name is Shelby Joseph Beaver. I encourage everyone to stop if they ever see an interesting cemetery because you'll never know what you'll find out! There's a Tombstone on the CofC Campus! ?